I just stumbled over a great biblical German site! In fact, most of the interesting websites I visit are in English; I know a couple or more in German, and no French. But this one is in German, and well worth a further consideration. You’ll find it at http://www.bibelwissenschaft.de/. The Hebrew text is of course vocalized and the greek texts accented. If you find that the text is somewhat small and dificult to read, you just change the size in your browser. If you register at the site you are given access to several other impressive information sources like a search function or info about e.g., the New Testament. and lots of information about digitalized version, for instance, for your Palm. 2) Then there is also a Bibelkunde section. Here you will find extensive information about all the books of the Bible, including an exposition of several biblical themes. 6. Aaron im Islam, 7. Aaron in der Kunst, Literaturverzeichnis, 1. Lexikonartikel, 2. Weitere Literatur, and # Abbildungsverzeichnis. Impressive indeed. I must admit I know of no other Bible web-site providing a comparable extensive range of texts and valuable information. Please use the Comment field below if there is any other ‘out there’ of equal scope and value. Of course, you need to be able to read German, but that is still nevertheless a must for a biblical scholar. Others unable to read German, but haveing a reading ability in Greek or Hebrew might still find the Bible editions available here useful. www.die-bibel.de. Here you can find find a lot of material relevant for your church, your pastor or other pesons engaged in church work. There even is a link to how you can get German translations on your Iphone! Visitors to these sites are to be grateful to the deutsche Bibelgesellschaft. Logos is announcing a great sale offering over at their blog: through the end of the year, they are having a sale on the 59-volume Word Biblical Commentary series. This digital set retails for $1,199.99, but is available for a limited time for only $599.95! And not only the set, but if you just want some volumes, you can get them at 50% off. I use their Bible software a lot, and do think that Logos Bible Software is a terrific software; now you also may save a lot of money on this offer. London: T&T Clark, 2007, pp. xxii + 226. B. Olsson & M. Zetterholm eds., The Ancient Synagogue from Its Origins until 200 C.E. (2003). A. Runesson, D. D. Binder, and B. Olsson, eds., The Ancient Synagogue from its Origins to 200 C.E. : A Source Book (2007). Mohr Siebeck, 2008. XIV, 304 pages. WUNT II 250. “Turn Away from Evil and Do Good! Reading 1 Peter in Light of Psalm 34.” A resyme of her work can be found here. (English version on p 2). According to the Norwegian system, there will be two test lectures the day before the defence, then the public disputatio that may last up to 4-5 hours, where the candidate will discuss her dissertation with two opponents. Alas, the info page at MF does not contain any info about the topics of the test lectures, nor the names of the opponents. Yesterday, Wednesday 19, the Norwegian New Testament society (Norsk Nytestamentlig FagForum) had its autumn meeting at the Faculty of Theology, University of Oslo. Immediately following, the Faculty of Theology arranged the ‘retirement lecture’ of Prof. teol.dr. David Hellholm. Friends and collegues from all over Norway had gathered to attend and thus celebrate prof. Hellholm. David Hellholm has been professor in the New Testament at this Faculty for the last 18 years, and before that he worked for some time at the University in Bergen. Prof. Hellholm will be well known for his works on Apocalypticism, but also on Paul the apostle, and now in more recent years on the historical and theological questions related to the Christian baptism. The latter is a project that will still go on for a couple of years, involving several other scholars too. A bibliography of his published works can be found here. 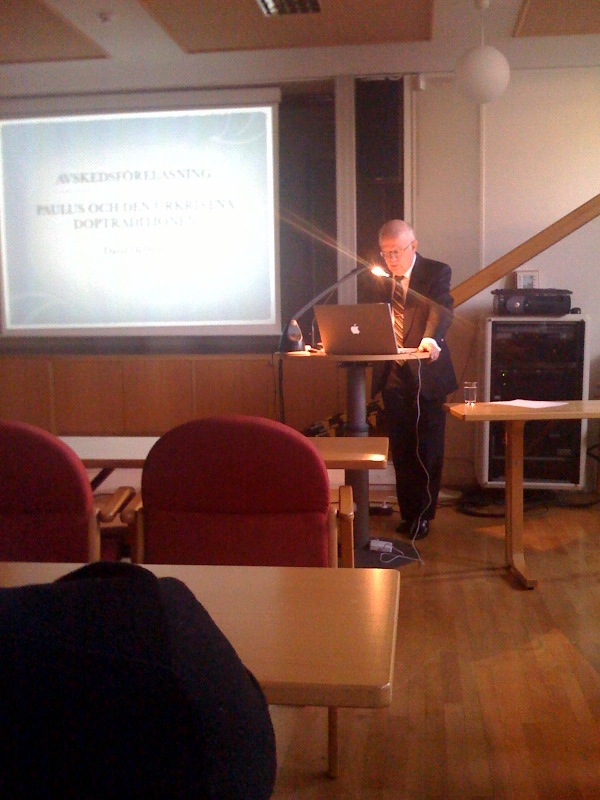 As a topic for his retirement lecture, prof Hellholm had chosen “Paulus och den urkristna doptraditionen” (Paul and the early Christian traditions of baptism). It was a discussion of some central texts in the letters of Paul, especially Gal 3,27-28; 1 Cor 12,13 and 6,11, just as thorough as all of us who has the privilege of knowing prof. Hellholm could have expected. An expert at work! In an additional session, also in honour of prof Hellhol, three younger scholars presented aspects from their own research. The way they did it, and the topics the presented, turned out to be really interesting. Vemund Blomquist provided insight into his reseach on Euthalius, and his work on a series of “Argumenta” or short summaries which are placed as introductions or summaries to the different books of the New Testament. Marianne Bjelland Kartzow presented ideas from a most recently inaugurated project on “Jesus in cultural complexity,” a project that involves several scholars. After these events, there was a Reception for prof Hellholm, in which several of his colleagues and friends presented words of praise in honour of him; all well deserved. has its own webpage at the publishers site. You can find the information here, and the volume can be ordered here too.